The San Francisco Municipal Transportation Agency (SFMTA) and San Francisco Beautiful (SFB) are teaming up for the second year to showcase the work of artists living in the Bay Area. Beginning today and until June 17th, artists from throughout the nine Bay Area counties are invited to submit proposals with the 2017 theme, “San Francisco Neighborhoods” for contest consideration. 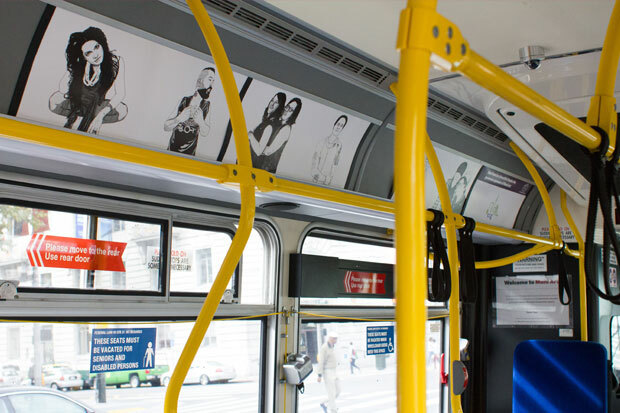 In August, five finalists will be announced and given the opportunity to transform Muni buses across the city into rolling art galleries for the delight of the over 700,000 daily commuters throughout San Francisco from January to May 2017. The 2015 Muni Art project was so successful that SFMTA decided to double the number of “art gallery” buses to 100 for the launch in January 2017, because of the large amount of public interest and voting. Last year, the 1st annual contest, SFMTA’s dressed-to-impress art buses hit the streets in tandem with the systemwide improvements of Muni Forward. Each work captured the spirit of San Francisco, translating it into interior car panels so it could ride alongside passengers. Another goal of the project was to spread the dressed buses throughout the city so as many riders as possible would have the opportunity to commute in a moving art gallery. The deadline for artists to submit proposals is June 17th at 6 p.m. A committee which includes local gallery owners and representatives from arts institutions will choose the ten finalists by July 22nd then the public will vote for the top five finalists between July 25th and August 9th with the winners announced on August 10th. In addition to having their art displayed on busses, the artist who receives the most votes will be awarded $2,000 and each of the remaining four will be awarded $1,250. For artist entry guidelines and sponsorship opportunities, please visit www.sfbeautiful.org/muniart or call Peter Clarke, Muni Art project manager at 415-636-5971 or email at peter@sfbeautiful.org.